We’ve long been fans of front-mounted bike seats for riding with young kids and have tested lots of them over the last five years. Although we’re reaching the end of our bike-seat days (sniff! ), we believe we’ve finally discovered the ultimate setup with the Mac Ride. The Mac Ride seat is lighter, narrower, safer, and more comfortable than any other “open-style” (harness-free) front-mounted bike seat that we’ve tested. The seat fits kids ages 2 to 5. We’ve been rocking it with my (rather small) 5.5-year-old on both pavement and mountain bike trails. 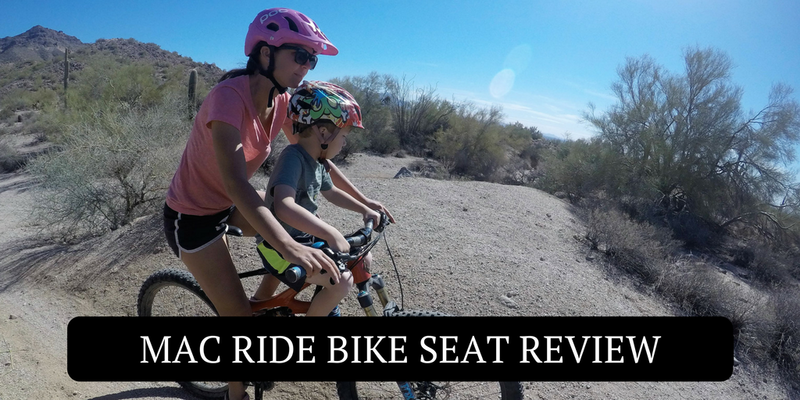 Unlike most other seats that warn against use on off-road trails, the Mac Ride is actually marketed to the mountain bike community. It works well on singletrack thanks to its ability to mount to all types of mountain bikes (including bikes with dropper posts), its narrower-than-average profile, and plenty of front-wheel clearance. While popular with the off-road crew, there is nothing stopping this seat from being used solely for around-town commuting and recreational bike path rides. In fact, it’s the perfect seat for whatever kind of riding you might want to do with your little one. First-time installation and adjustment of the Mac Ride take a bit of effort, but after that, it installs quickly (2-3 minutes). The seat attaches to the bike in two places: to the headset via a special spacer and to the seatpost. 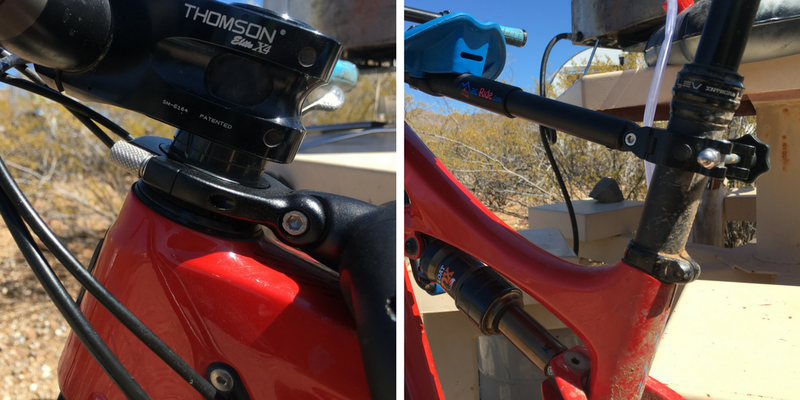 Thanks to the unique geometry and weight distribution, the seat clamps onto the seatpost below the dropper and doesn’t place undue stress on the post making it suitable for dropper-posts or carbon fiber seatposts. This is a huge plus, and sets the Mac Ride apart from other child-hauling products on the market. The only (minor) con in the design is the fact that the seat requires the installation of a special headset spacer. Initially, this caused me to groan a bit, but in the end, it wasn’t that big of a deal. On my Ibis Mojo, the special spacer replaced two regular headset spacers and only took a few minutes to swap out. The seat comes with a second spacer, so you can swap the seat easily between two different bikes. The only time I see the headset thing being a real issue is if you are renting or borrowing a bike. For instance, we’ve used our TykeToter several times while on vacation. The seat is small enough to toss in a carry-on bag and can quickly attach to a city bike or rental bike. That’s not possible with the Mac Ride. Once the headset spacer is installed, the front ring of the bike seat clamps on via a hex-bolt. Tightening this is easy, but does require an allen wrench (not included). Next, the post that the child’s seat sits on expands to fit any size frame (love this! ), and the other end clamps onto the adult’s seatpost. No tools are required for this step. My favorite part of the Mac Ride is the adjustable stirrups. The legs are retractable and have several different length settings so that they can grow with your child. For my 5-year-old, the legs are extended to their full length. The child’s feet can be secured to the foot pegs via adjustable, sturdy rubber straps. This is a very important thing to take note of. We used the TykeToter for several years, and while we loved it, I never felt comfortable fully recommending it to parents due to the lack of stirrups. In one scary incident, my son’s foot got stuck in the front wheel causing an accident that required an urgent care visit. Another close competitor, The DoLittle seat, includes stirrups that address the safety issue, but Mac Ride one-ups their stirrup design by making the legs extendable. Not only are the legs extendable to improve comfort for the child, they also rotate forward or backward in order to adjust both for maximum comfort and for safety. When we initially installed the seat, my son’s foot was awfully close to the front wheel when my fork compressed. With a small adjustment (allen wrench required), we were able to change the angle of the legs providing PLENTY of clearance between his feet and the front wheel. Thanks to the extendable bar and the weight distribution, the Mac Ride is compatible with most bikes. It works as well on my husband’s large size mountain bike frame as it does on my size small. As previously mentioned, it is also compatible with most dropper posts which is a huge plus in my book. There are a few notable exceptions to the near-universal compatibility. The Mac Ride is NOT compatible with drop-bar road bikes, Cannondale lefty forks, and several other unique setups. Check the Mac Ride website before ordering to ensure that your bike doesn’t fit into one of those unique categories. Compared to virtually all other child-hauling devices, the Mac Ride is crazy light. This is kind to the parent (those kids are heavy enough) and makes the seat really easy to transport and store. When not in use, the seat folds up nice and tidy and can be stuffed in a backpack or stored on a shelf or bin. Within a mile or two of our first ride, both my son and I quickly agreed that the Mac Ride is our favorite front-mounted seat that we’ve used. The seat is both narrower and further forward than many other front-mounted seats, making it easier for me to pedal and maneuver up and over obstacles. For the child, the seat, while minimal, is comfortable and soft. I immediately noticed that my always wiggly kiddo was considerably less wiggly in this seat than others, presumably because his backside is more comfortable. His body position and angle on the seat also seemed better on this seat than others, and he has mentioned several times that the Mac Ride is his new bike seat of choice. Like other front-mounted child bike seats, the Mac Ride is super interactive. Thanks to being in such close physical proximity to your child, you’re able to chat easily while you ride. My son and I sing songs, practice counting, and tell each other silly stories while we ride. It’s non-stop chatter. When we’re mountain biking, he also enjoys picking out a good line and cheers us on. Although this interaction isn’t unique to the Mac Ride, it does give it an edge up (in my book) to other options like the Weehoo trailer-cycle. We’ve used trailers, trailer-cycles, and rear-mounted seats, and the front-mounted seat always wins out for me thanks to the interaction factor. The end of our front-mounted bike seat days are coming to an end soon, and they will be greatly missed. 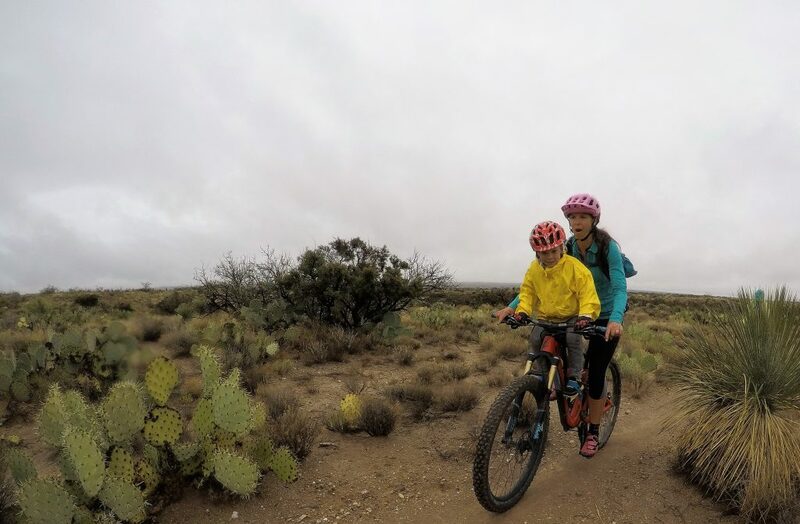 Not all parents are going to be comfortable doing real mountain biking with their young child, but for those that are, the Mac Ride makes it possible. 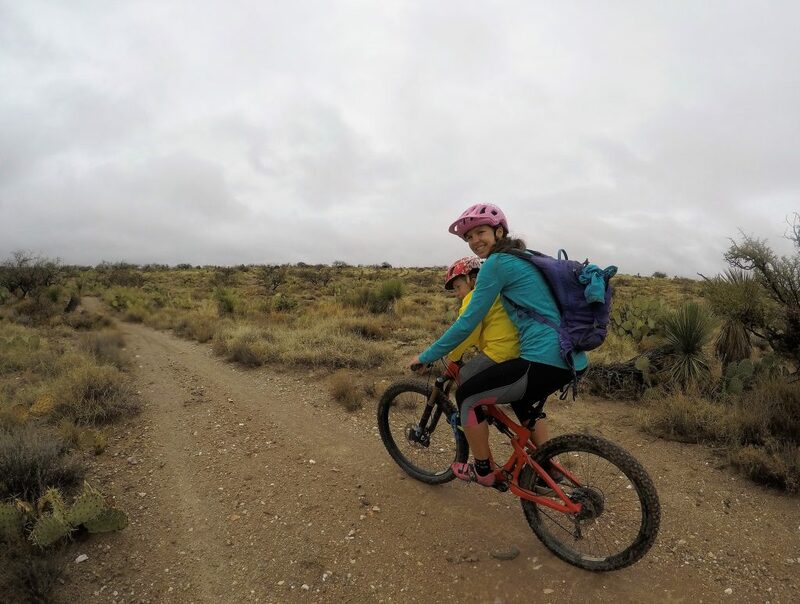 Our family has been using a variety of front-mounted bike seats on mountain bike trails since our son was a year-old and we love the ability it gives us to get out as a family. Of all the seats we’ve tried, the Mac Ride is best suited both for fitting on a mountain bike and providing an adequate range of movement for the adult. As previously mentioned, I feel like the seat positions the child far enough forward that I have space to maneuver up and out of the saddle. The seat is also narrow enough that the amount of bow-legged pedaling is minimal. Nonetheless, I find the seat most comfortable for rides under 10 miles. After that, the knees start getting a bit sore. Thanks to the sturdy stirrups, children are also able to stand, hands on the bars, and learn to shift their weight as needed and absorb bumps with bended knees and arms. This aids in their overall understanding of body positioning with mountain biking, and aids the parent in shifting weight on the bike. Mac Ride also offers optional child grips that can be installed on the parent’s handlebars. These grips not only provide additional safety and comfort for the child, but encourage the child to keep their hands on the bars and learn to be involved with steering and maneuvering the bike. As far as mountain biking with the Mac Ride goes, the safety of the seat correlates directly with the skill level of the parent. 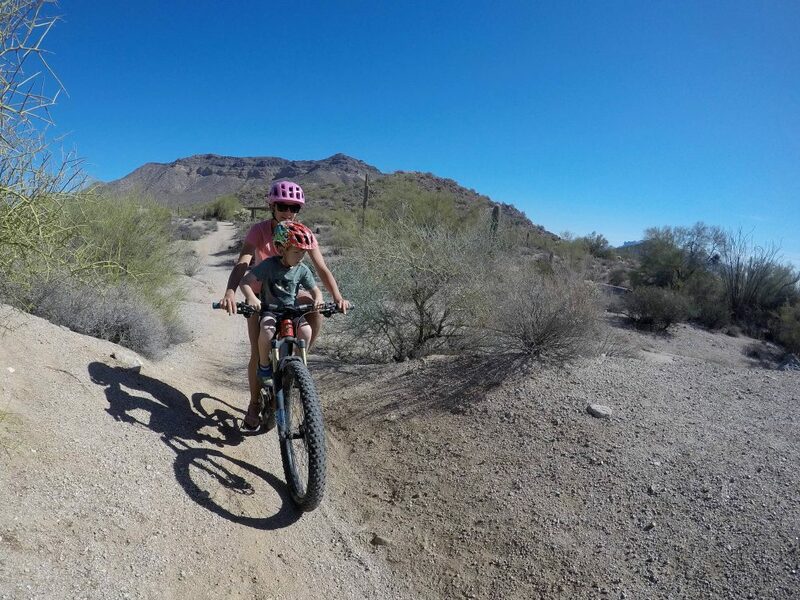 If you’re not sure you’re comfortable mountain biking with your child on the Mac Ride, you probably shouldn’t be. Both my husband and I are experienced mountain bikers who feel comfortable tackling singletrack with our child on board, and we’ve never had a problem or a serious crash. For riding around town and on bike paths, most parents should be able to ride comfortably with their child aboard. Because there isn’t a harness, it is important to make sure that your child is old enough and compliant enough to know to hold on, not to take their feet out of the stirrups, etc. By 2 or 3, most kids should be able to manage this. Of all the “open” style (no-harness) bike seats we’ve tried, the Mac Ride is the unparalleled winner thanks to the adjustable foot stirrups and comfort for adult and child. 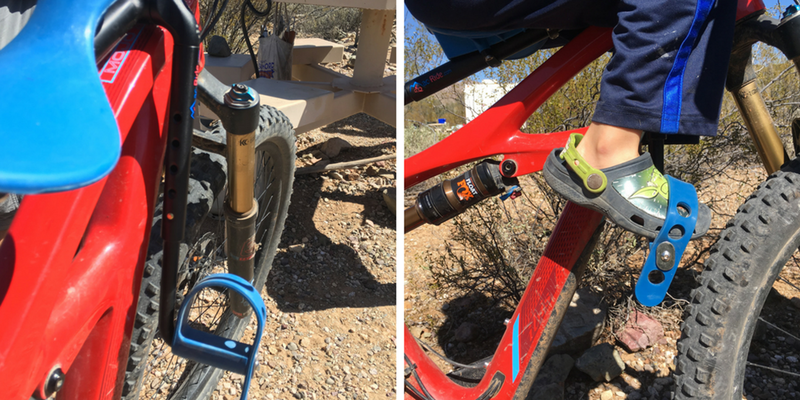 The TykeToter comes in at a more affordable pricepoint, and we appreciate the super-quick, no-tools-required install, but the lack of foot stirrups will be a deal breaker for many. The DoLittle does have foot stirrups, but they lack the adjustability of the Mac-Ride and the seat is a bit more awkward to install and position. The only big ding against the Mac Ride when comparing the three seats is the price. Nearly double the price of the TykeToter and DoLittle, the price of the Mac Ride may be a bit tough to stomach for parents on a budget. If your child is between the ages of 2 and 5, and you like the idea of an open-style front-mounted seat, consider the Mac Ride. Of all the seats we’ve tested in this category, the Mac Ride is the undisputed winner. It is comfortable for both child and adult, fits on a wide variety of bikes, and can be used safely on or off-road. Compared to other types of child-haulers, the Mac Ride offers maximum parent-child interaction and entertainment for your little one.